First off, you must realize, I am a skeptic to say the least. I find it compelling to disprove haunted places. Don't get me wrong, I have seen truly unexplained paranormal entities. But, I am a "seeing-is-believing" person. 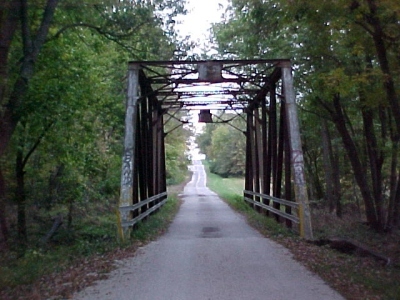 I read about an iron bridge in Central Illinois that was supposed to be haunted. The story behind the bridge was that a man hung himself from it. If you drive over the bridge at night, you can experience car problems (stalling etc...) Also, if you look in your rear view mirror, you could see him still hanging there. 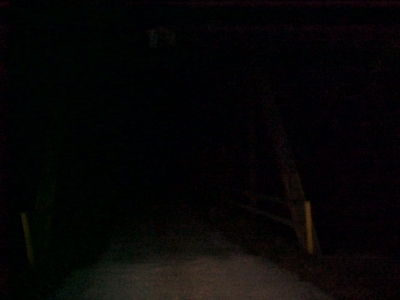 I did a little research on the story, and indeed, a man had hung himself from this bridge. 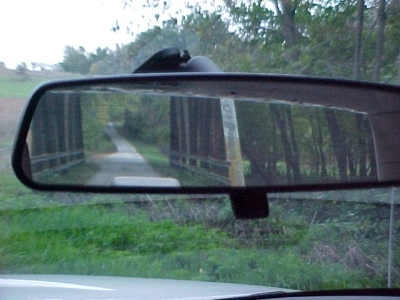 I traveled to the bridge in the day light, and took some pictures (the camera was a Sony MVC-FD73), including a rearview mirror pic. Nothing out of the ordinary. You must realize, this was mid October,it was 42 degrees there were no bugs flying around,I was on foot, no vehicles, and there wasn't any dust being stirred up. When you zoom in on the pic, the sphere to the lower right has a glow that almost looks like - the only way I can describe it is - an old railroad lantern. It is almost hexagon shaped with what appears to be a white glow inside. The second one looks like - the only other thing I could describe it looking like is an old time divers helmet. You know the ones with the glass windows that open? It isa bluish green color that has an internal glow to it, and a defined shape. It has its own luminous glow, which to me, is what sets a true orb from a dust particle. I know that sounds like alot, but, that's why I thought it was so unique. Orbs are not very ghostly. They are balls of energy that for but these pics are dust orbs are a perfect circle. In the rear view mirror pic there is a picture of a Native American person. I believe it is a woman. If you look to the right of the picture in between the 2 biggest trees there is a smaller sapling. Next to that sapling is a long black haired woman with some kind of sash around her waist. There are always bugs and always dust, even if you can't see them, usually because you are not looking for them or simply don't notice them. This being said, I dont believe orbs are paranormal. Kudos to you for giving all the information you gave the viewers tho, not many people would do that. I know you say it was only 42 out that night, but the bridge is outside and dust can be conjured up without being seen with the naked eye. The flash from the camera or and light being emitted from the moon or what not will catch on these dust particles (doesn't even have to be full blown dust) or any moisture particle in the air.. in the pics without the so called orbs, it might not have caught on the particles at that time..
Also real orbs show their own flight path. Good try though hun...good pic! Top left one looks like a head. Bottom right one is looks like a divers helmet. 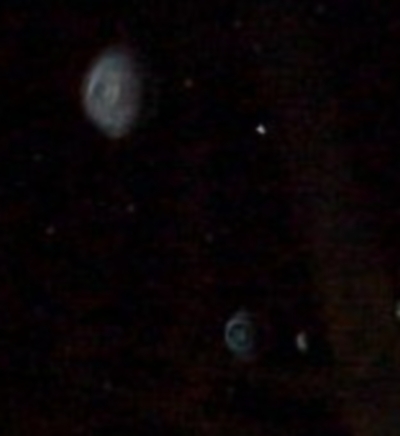 The fact that the orbs only appeared when the flash was on would imply dust or floating debris. I have to say, I'm not completely sold on the whole orb thing but the definition of an orb states that they produce their own light so that being said, it would have been detected even if the flash was not present. Good pics but no orbs. Around 1990 I outside on a cold fall night in Minnesota when I looked up to the stars. I was at our cabin and the sky was full of stars. I noticed a strange ball of bright green color as it floated just above the tree tops. It was not going very fast but you could see that it was drifting from the west heading east. Then it was gone as it floated into the tree tops. I never told anybody because I thought that nobody would believe me but here it is. When I was a young man living on a farm in Ohio I would see these exact same type orbs, usually in the very early morning hours before dawn. They would move very slowly without sound..To this day I surly would like to know what they were. Well, this is a very interesting picture, it could be a few orbs maybe? That is a very good possibility. Although, The humidity wasn't very high that night, which it would've had to be high humidity to produce enough dew to actually drip from the leaves. You made a reference about the dew..., you said it is condensation that settles on the surface. Your right, however... I see a lot of leaves hanging over the bridge. Dew will also settle on leaves until they get too heavy and seemingly float to the ground. These photos could very well be from the other world but, I'm inclined to think that it is just droplets of dew from the leaves. Great pic anyway and some great discussion to boot. i swear i tought that the second photo was from "stand by me" sorry but that is some serious stuff going on there. The only reason you don't pick up orbs without a flash, would probably have something to do with the fact that it's dark. If it were light in the area being photographed, you wouldn't need a flash. As for orbs, There are so many factors to consider. Some could be considered paranormal, and some not. I don't believe you could truly decipher between the two, unless you had video footage of one that manifested into another form of energy. What is unique about this photo, is the differential of color inside the sphere itself. Is it paranormal, who knows, but it is unique. Spirits, bugs, dust or a special form of light. Orbs appear in so many places, so because they appear everywhere, it could be normal - special forms of light, for example. Whether any of you have noticed, when you take a picture, (without the flash) no orbs appear, but when you take the picture with flash, they usually appear. I find this quite interesting. Thank you for posting it. You may possibly be right wwith the moisture idea on the small white specks. As for dew though, dew forms on the surface from condensation and stays there, and moisture saturation that is enough to see is fog. But, I do agree, the small white specks could be humidity. As for the 2 large ones, if they were moisture, it would have been rain.There wasn't a cloud in the sky that night. I really do welcome and appreciate the speculation! This is a really great forum to try and calculate what something is and is not. When I made the comment about it being moisture, I was leaning more towards it being that the flash was bouncing off of moisture in the air. I know there have been several times that I've taken pictures in the house, and there are no orbs in the pictures at all, and the next one I take has like 10. One thing about this to me is that the one orb does have a rectangular shape to it. This is a good picture regardless of if they are spiritual orbs or moisture. Some of the orbs in the distance more so, are brightly lit, and the ones up close are large and do not seem to be right on top of the camera to be reflecting so much light off the flash. I am a hard sell when it comes to orbs because they can show up for so many reasons. But this is an interesting picture. The last photo has been blown up to show these spheres. Don't really see anything myself. And although I have had--a few personal experiences, in my view, they don't count because no one was there. So it's just my word and I will not ask anyone to just take my word for it. 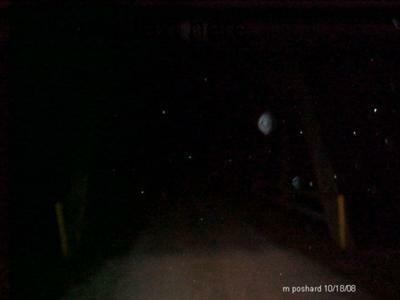 To truly see these orbs, you need to capture pic and zoom in on them. Thanx for your comment Lisa. alternate view, and nothing was on my lens. I keep the lens cover on at all time when not pushing off pics. I also religiously wipe the lens. I do this no matter what type of picture I am taking. But all that said, it is still possible. I am wondering if this could be moisture, since it is the fall and it is so cool out. If it was late at night there would be dew formed/forming. Thanks for the pic. Even though this is an orb pic, the reason I accepted it was because of your diligence. 3) You gave a bonus - additional views of the area.